Brilliant Barnett bags Bank Holiday beauty! "We got a little convoy, ain't she a beautiful sight.....!" Under a beautiful blue sky Crawley Town fans were out in force yesterday as 621 travelled to the Kassam Stadium for the Reds latest league match. The day started at the Broadfield Stadium at 11 AM, where CTSA were proud to unveil their new travel partner, Clarkes of London. Five gleaming green coaches loaded 260 fans and the adventure commenced as the vehicles drove in convoy up the M23 around the M25 and up the M40. 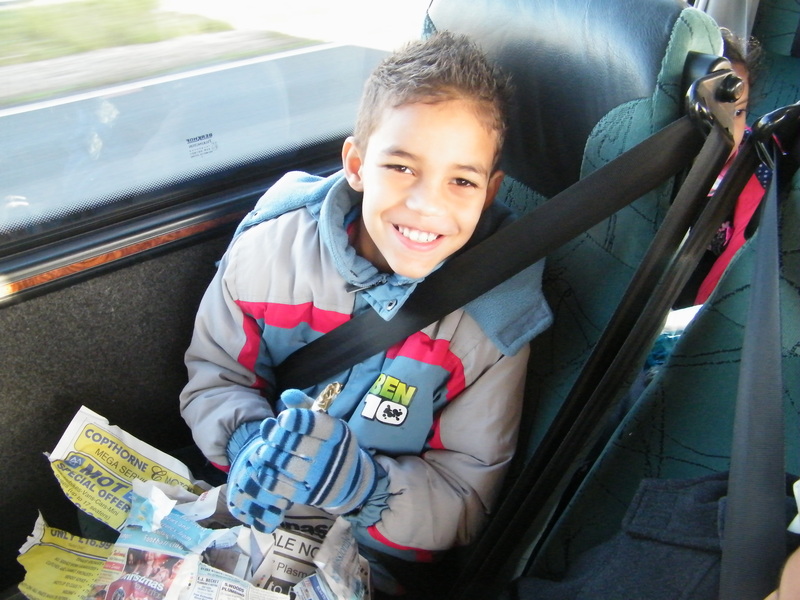 As part of our continued effort to attract more away fans CTSA board member Owen Pickering worked tirelessly to galvanise around 100 new supporters to travel away and support our team, filling two coaches. 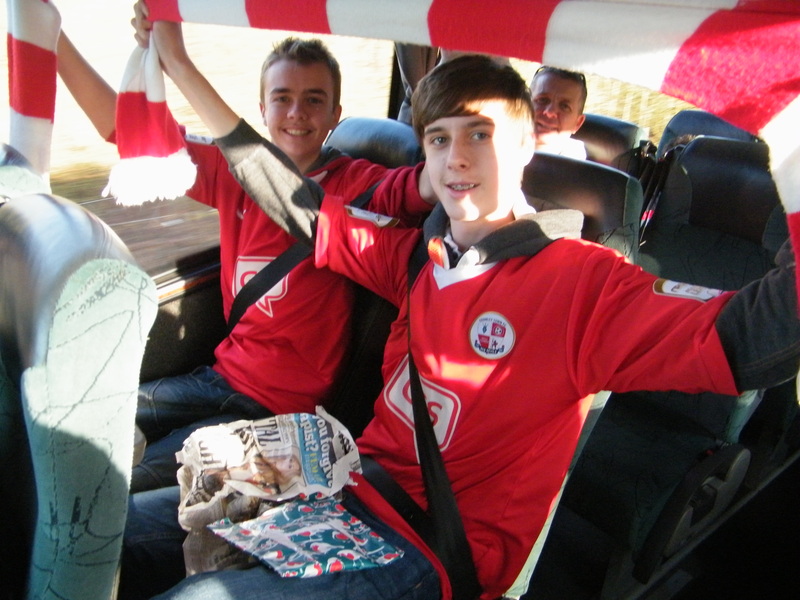 He commented,”hopefully they will have a great day out and become as addicted to CTFC as the rest of us!” On the journey passengers were treated to a CTFC video, refreshments, and on the two community coaches had pass the parcel and sweets for the children. Great fun was had by all! Tickets for the grand New Years raffle were sold on all 5 coaches. 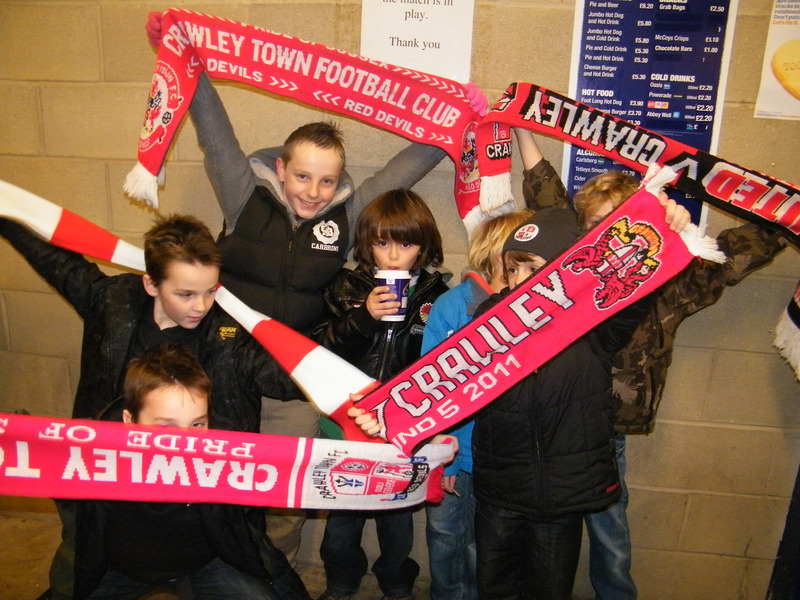 There were some great prizes but everyone wanted the signed CTFC shirt up for grabs. 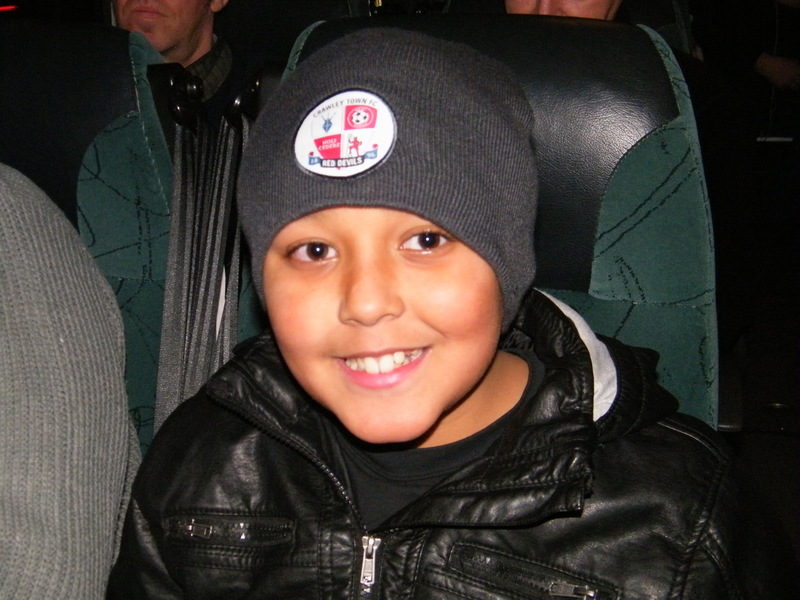 It was ultimately won by Krunaal Patel, who deserved a little luck after recently being taken ill at our game at Crewe. Special mention to Andy Tester who won a Soap and Glory gift set! Two pass the parcel experts! 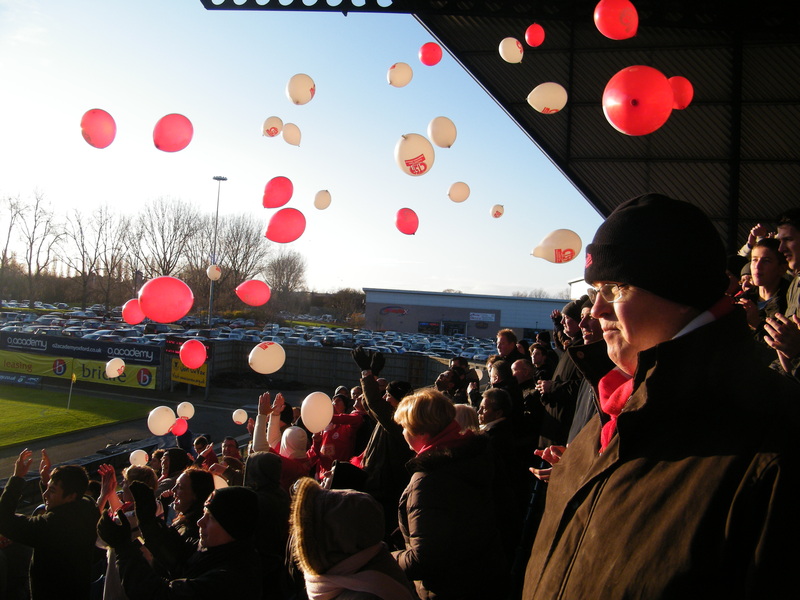 We all had a brilliant view of the action from the Webber North stand and it has to be said that the atmosphere in the ground was red hot. 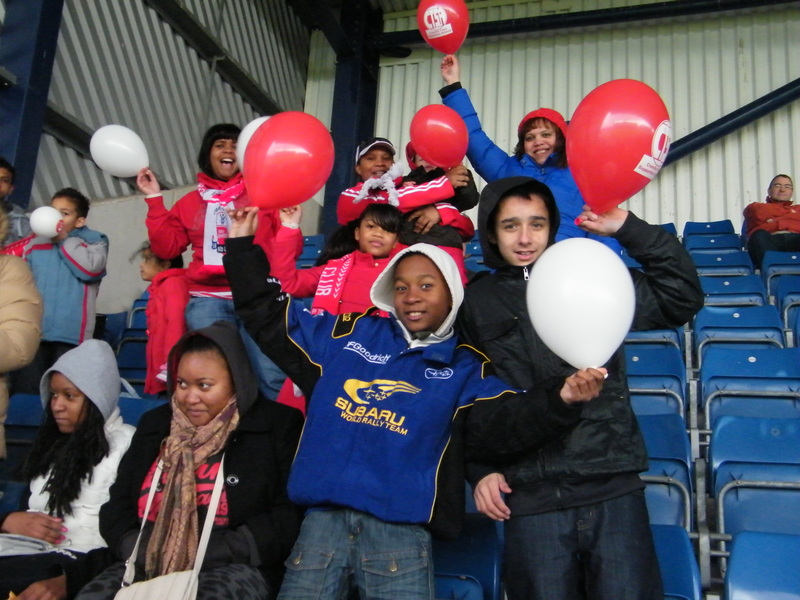 Both sets of fans were in great form creating a lot of noise. During a goalless 1st half the teams were getting stuck in leading to several fierce tackles and yellow cards- though it was quite surprising that most of the yellow cards seemed to be going our way. Chances were few and far between. Midway through the 2nd half a goal keeping error allowed ex Crawley player John Paul Pittman to slide in the opener, though he was respectful and didn’t celebrate in front of us. It kept the away fans quiet for 10 mins but in a rousing finale Tyrone Barnett hammered home a well deserved equaliser sending 621 people into wild celebration before happily heading home. 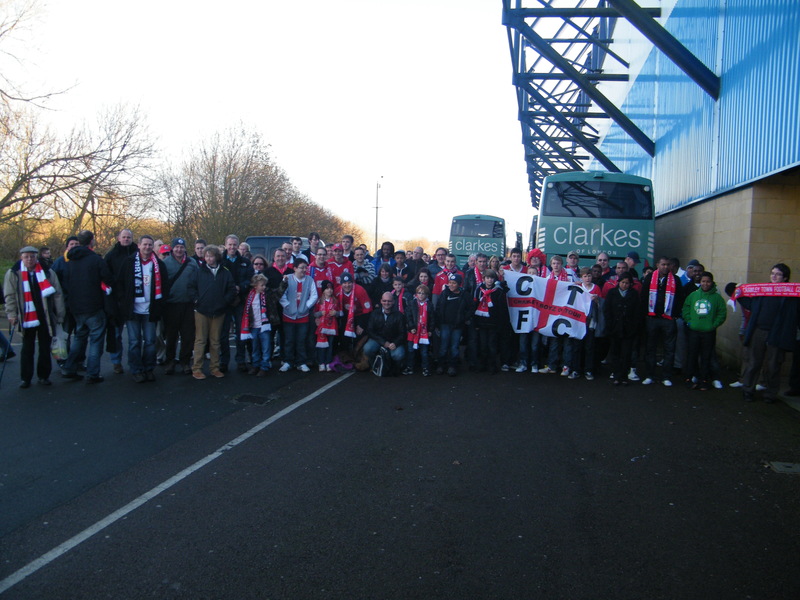 Before the game with the CTFC Massive! A red and white extravaganza! 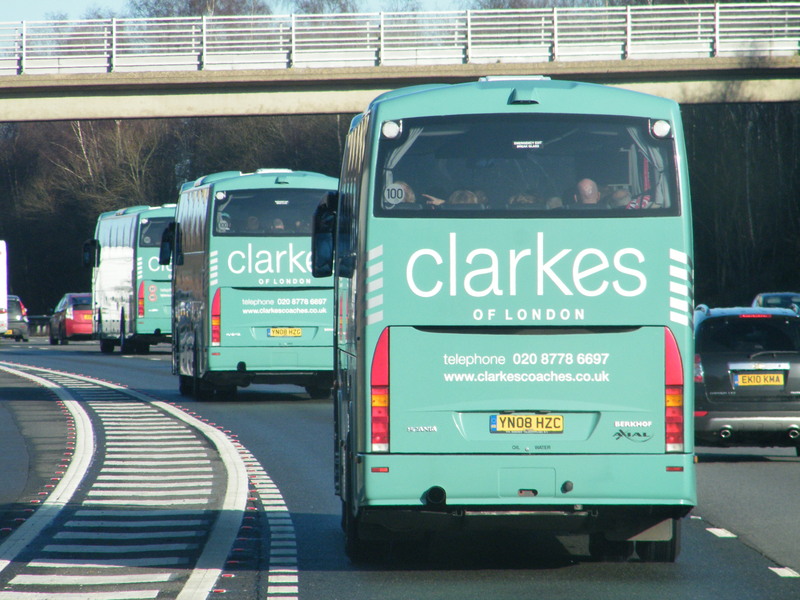 After faultless transfers up and back it seems as though the partnership between CTSA and Clarkes of London has commenced in great fashion. From being with them for the day it does feel that we are in good hands and their vehicles are very comfortable -but let us have your feedback. The next test will be our trip to Bristol Rovers on 14th January. Hopefully you will all be coming especially for the staggering price of £10 ! All at CTSA hope you have all had a great experience today topped by that stunning late Tyrone strike. Watch out for further travel news soon. A half time hot chocolate!